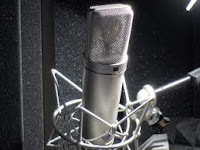 The Neumann U87 is a world class microphone that gives vocals a very warm and pleasant sound. You can use it as an omnidirectional, cardioid, or figure-8 pattern. I am very fortunate to own one of these and I must say it is worth the money. The clarity of vocal recordings it puts out is truly amazing. It comes with a shock-mount, wind screen and wooden box. Of course you can also record instruments with it but vocals is where it clearly stands out. It is priced at around $3600 at Guitar Center. Use the link below for exclusive deals.